Are you experiencing issues with one of the Microsoft Office 365 programs? 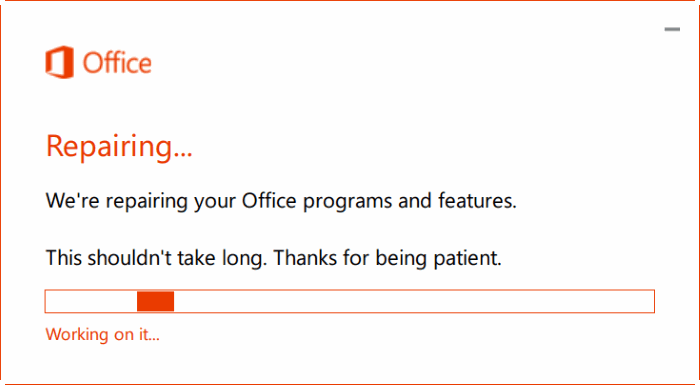 Want to repair the Office 365 on Windows 10 without actually reinstalling? In this guide, we will see how to safely repair Office 365 installation on Windows 10. Ever since Microsoft introduced Office 365, a large number of PC users are buying subscription based Office 365 instead of going for traditional Office versions. 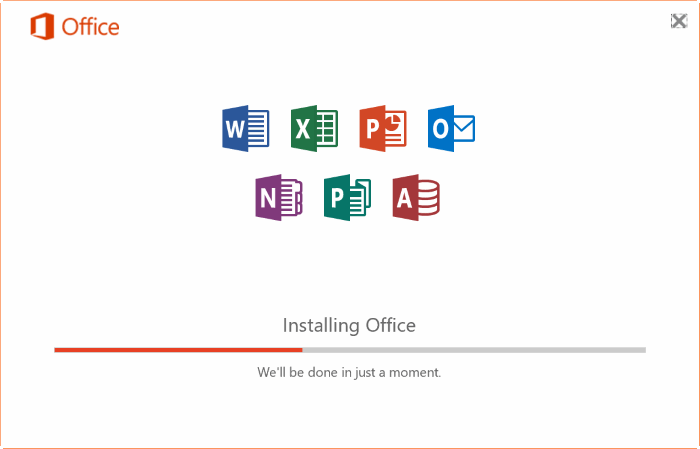 One of the benefits of Office 365 is that the user always gets to use the latest version of Microsoft Office. Although Office 2010 and Office 2013 are compatible with Windows 10, most users are using Office 365 and Office 2016 on Windows 10. There is an official Office 365 troubleshooting tool available to common Office 365 issues but it might not be able to resolve all Office 365 problems and errors. 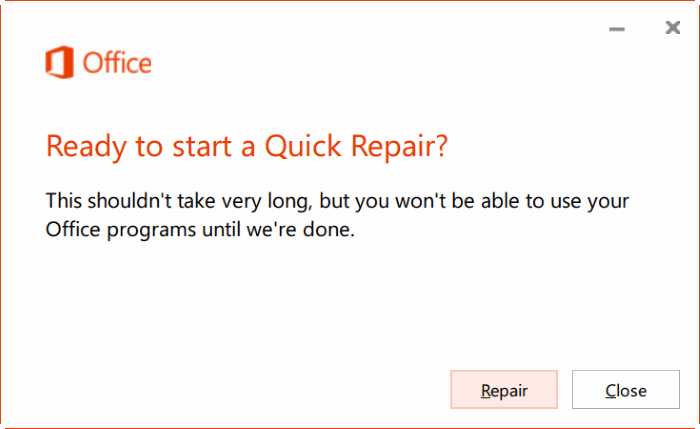 If you’re experiencing issues while opening or using one of the Office 365 programs you can easily fix these issues by repairing Office 365 installation on Windows 10. 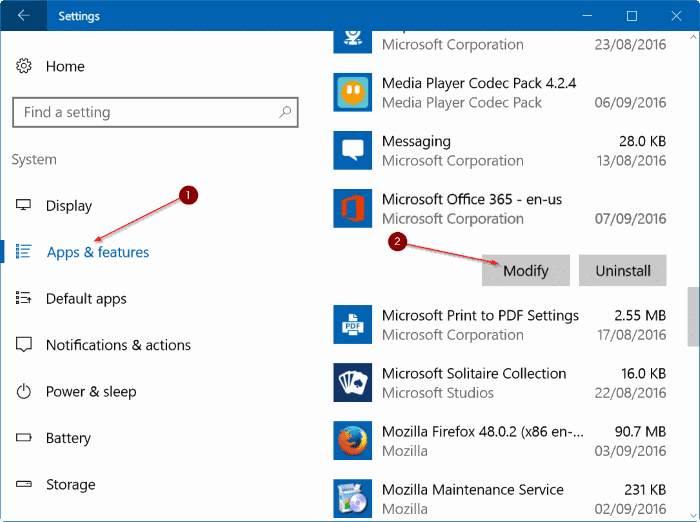 In this guide, we will walk you steps to help you repair Office 365 installation on Windows 10. 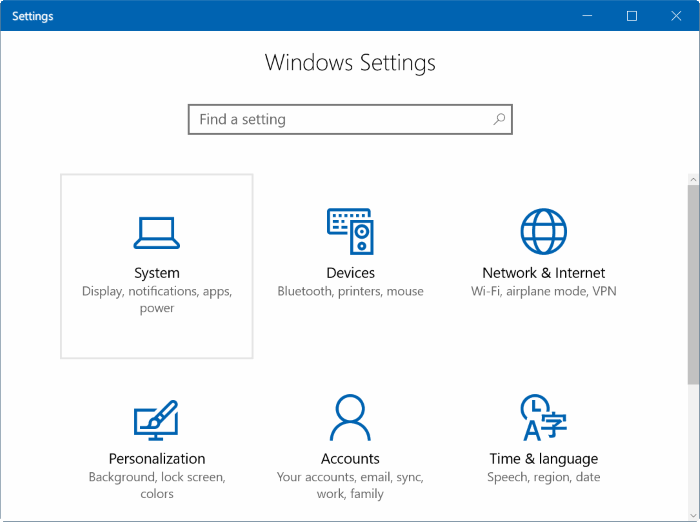 Step 1: Open Start menu and click on the Settings icon to open Settings app. If the Start menu is not opening, use Windows logo + I hotkey to open Settings app. Step 2: Click System icon and then click Apps & features to view all installed desktop programs as well as apps from Store. Step 3: Look for Office 365 entry, click on it to reveal Modify and Uninstall buttons, and then click Modify button. Step 4: Upon clicking the Modify button, you will see the User Account Control prompt where you need to click Yes button to see the following dialog with Quick Repair and Online Repair options. As the dialog says, Quick Repair fixes most of the issues and doesn’t require an internet connection. The Online Repair feature fixes all issues but requires an internet connection. 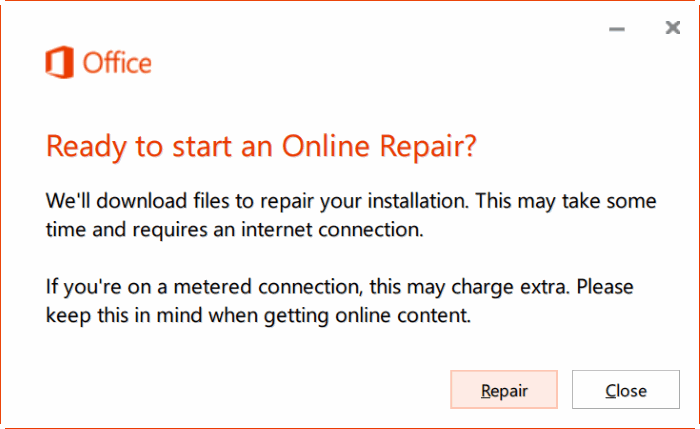 The Online Repair is similar to reinstalling Office 365 as it requires you to activate your copy of Office after the repair job. We recommend Online Repair only if an issue persists even after trying Quick Repair. 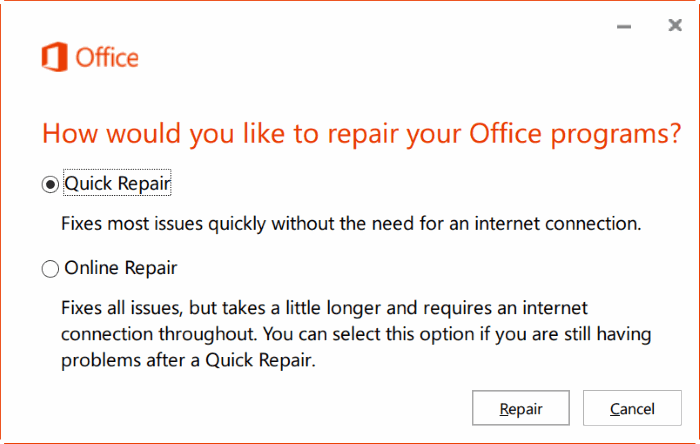 Also, you might lose your Office customization and settings if you opt for Online Repair. 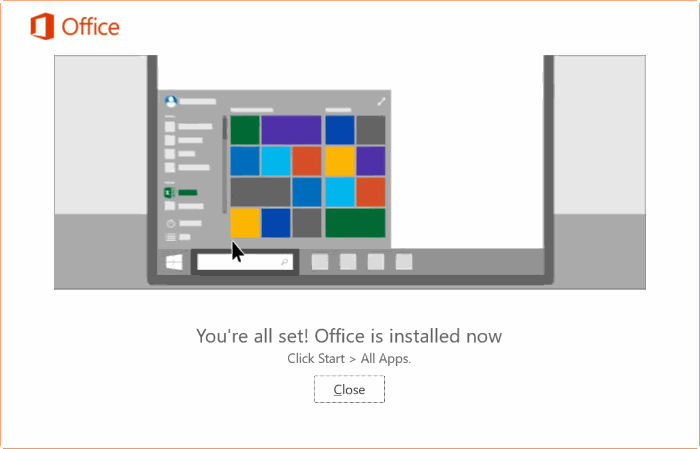 If you click the Quick Repair option, you will see the following confirmation box where you have to click Repair button to begin repairing your Office 365 installation on Windows 10. And if you choose Online Repair option and click Repair button you will see a confirmation dialog where you need to click Repair button to begin downloading and installing a fresh and latest version of Office 365 on your PC. Depending on your internet connection speed, the time required to complete Online Repair might vary from a few minutes to hours. 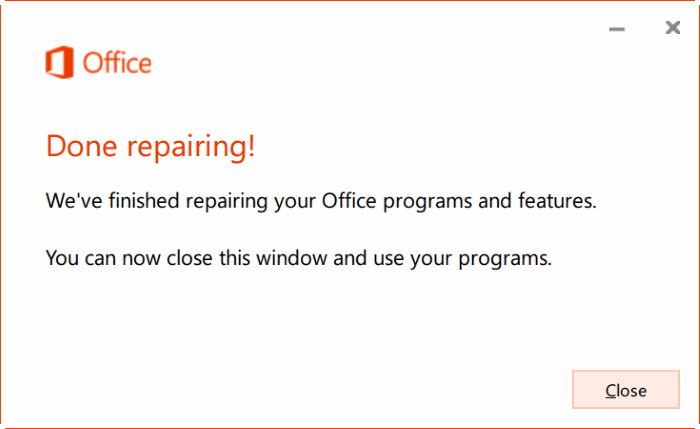 Once the Online Repair is done, you will see Office is installed now message. 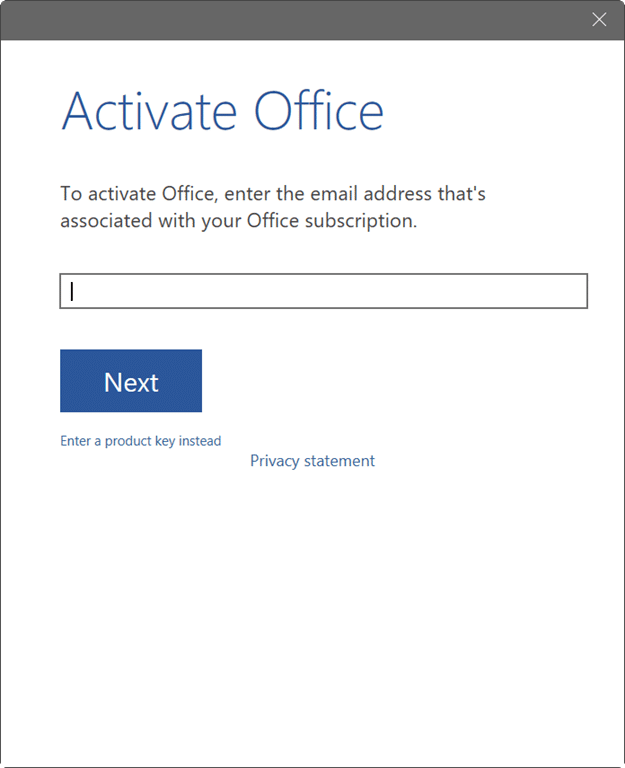 Once done, launch any Office program such as Word, enter your email address which you used to purchase Office subscription to activate your copy of Office 365 on Windows 10. If you have a product key, you can enter the same by clicking Enter a product key instead link. Don’t forget to check out your Office 365 subscription expiry date. Great instructions and very helpful. It actually seems to have worked and solved the problem!